Paskin – 50ft Cruiser stern is a loveable boat in every respect. 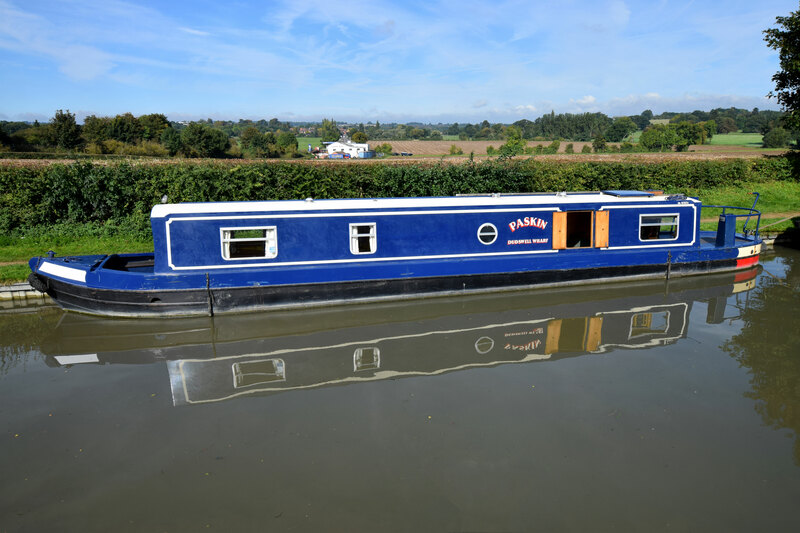 She is a 50’ cruiser stern narrowboat with a semi reverse layout which includes a dinette, and the use of space on board is well thought out and has resulted in a boat that offers all that is needed for a floating home or holiday home. Built in 2008 by Sterling Narrowboats, she is equipped with central heating (diesel fired), an 1800w inverter, she can sleep 4 (fixed double and dinette conversion), and is propelled by the popular Vetus marinised engine. Entering in from the stern down into the galley. In here there is the sink unit, a Spinflo cooker with a 4 burner gas hob, oven & grill, a 12v Shoreline fridge and ample storage space. The dinette follows (with side hatch opposite). This has storage under and doubles up as a second double berth. The walk through bathroom follows. An easy access Thetford cassette loo is in here, along with a good sized quadrant shower and ceramic basin. The towel rail provides additional heat and there is storage between the shower and the gunwales. On into the bedroom; a lovely and simple room with a fixed double bed with storage under, and a cupboard over the foot of the bed. And into the saloon, the room which I think defines the character of this boat. A cottage sitting room; two armchairs, shelf space, a wardrobe and shelves for personal effects. There is a TV aerial point and an Ipod station in here. This is a really cosy room for an evening relaxing over board games or books. Paskin – 50ft Cruiser stern is a truely delightful boat; charming, full of character and a really well thought out use of space.